The textbook is designed for classical guitar majors who have never had formal instruction in classical guitar technique, or who need remedial training at the college level. It may be used as a textbook for beginning guitar classes, or by anyone who wishes to develop an efficient and relaxed guitar technique. “THE College Level Classical Guitar Method Book” also has QR codes, which provide immediate, detailed video demonstrations of each of the exercises. QR (or Quick Response) codes are a type of matrix barcode that can be easily read by electronic devices that have a built in camera, such as smartphones, tablets, laptop computers, etc. Published by Linus Publication, the book is available at the Pensacola State College campus bookstore, The Textbook Broker and online at LinusBooks.com. Stallings has been teaching classical guitar for more than 35 years. He is the founder and director of the guitar program at Pensacola State where he teaches Classical Guitar, Beginning Guitar Class, Music Theory, Sight Singing and Ear Training. 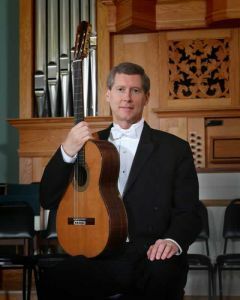 He also directs the Pensacola Guitar Orchestra, is founder and chairman of the Pensacola Guitar Society and founder and faculty advisor for the Pensacola State College Guitar Association. He earned a Bachelor of Arts degree in Music Theory and Composition and a Master of Music degree in Guitar Performance from Western Kentucky University, and Doctorate of Musical Arts in Guitar Performance from Arizona State University. He is a recipient of the 1996 N.I.S.O.D. Excellence Award from The National Institute for Staff and Organizational Development and the 1992, 1988, and 1986 Department of Music and Theatre’s Teaching Excellence Awards. A published author and composer, Stallings has been a member of the Pensacola State College Academy of Teaching Excellence since 1995.